Debris flow is one of the major secondary mountain hazards following the earthquake. 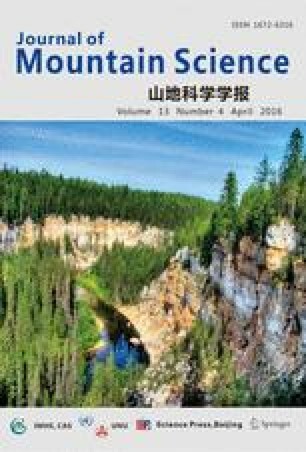 This study explores the dynamic initiation mechanism of debris flows based on the strength reduction of soils through static and dynamic triaxial tests. A series of static and dynamic triaxial tests were conducted on samples in the lab. The samples were prepared according to different grain size distribution, degree of saturation and earthquake magnitudes. The relations of dynamic shear strength, degree of saturation, and number of cycles are summarized through analyzing experimental results. The findings show that the gravelly soil with a wide and continuous gradation has a critical degree of saturation of approximately 87%, above which debris flows will be triggered by rainfall, while the debris flow will be triggered at a critical degree of saturation of about 73% under the effect of rainfall and earthquake (M>6.5). Debris flow initiation is developed in the humidification process, and the earthquake provides energy for triggering debris flows. Debris flows are more likely to be triggered at the relatively low saturation under dynamic loading than under static loading. The resistance of debris flow triggering relies more on internal frication angle than soil cohesion under the effect of rainfall and earthquake. The conclusions provide an experimental analysis method for dynamic initiation mechanism of debris flows.